Cantilever Racking – Canadian Rack Inc.
Cantilever racking is ideal for loads that require no obstruction at the pick face, so that bulky and awkwardly sized or shaped products can be safely stored and accessed. 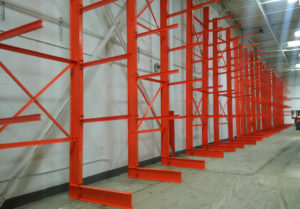 This type of racking allows you to use your warehouse space more efficiently – you do not need to waste horizontal space with awkward posts and columns obstructing storage areas. Items best suited to such a system include furniture, building materials, piping, rolls, appliances, and flooring. In essence, if you have irregularly shaped items then cantilever racking is the ideal choice for you. You can fit this racking system to your facility by adjusting the shelf height, ensuring that the maximum amount of vertical storage space is maintained. Moreover, the support arms can vary in depth and capacity depending on the type of load. Open rows allow not only secure load support but also easy access – safety, flexibility and selectivity are all maintained. We can supply cantilever of all sizes customized and manufactured to your needs, or we can supply quickly from our large inventory of cantilever racks we have in stock.